Carbon Steel, Wood Handle and a simple eye-bolt to hang it up. I had been living in San Francisco for a couple of years and I had finally decided to get a wok. It was 1983, I was doing a lot of artistic metal work, playing music and generally just having fun. I realized it was time to settle down and start behaving like an adult. To me that meant cooking utensils. I lived a few blocks from Macy’s on Union Square and had gone to the Cellar to check out their kitchen stuff. A lot of their basics cost more than I made in a week so that was out of the question. I remembered my Mother’s pots and pans: All old, dented and still useful. So I decided to look for more practical pieces that wouldn’t break the bank. Since I was (and still am) a bit of a germaphobe I couldn’t bring myself to buy used stuff at Goodwill. So I took the 38 Geary down and then hopped on the 30 Stockton to Chinatown. It was a strange thing to say, but she was right. I have become friends with my wok, it always stands by, waiting patiently to be used in the creation of something delicious. When the wok was new the color was light grey and metallic. Over years the wok is now fully carbon black. The outside is nicely crusted with 30 plus years of burnt stuff. The inside is smooth and black, a natural non-stick surface. I use the wok not only for cooking meals, but also to heat up left overs, it is my main cooking utensil and my microwave. I protect my friend too. When I came home and a roommate had used my wok to cook tomato sauce, and had taken the patina off the inside from the acidity I kicked him out. 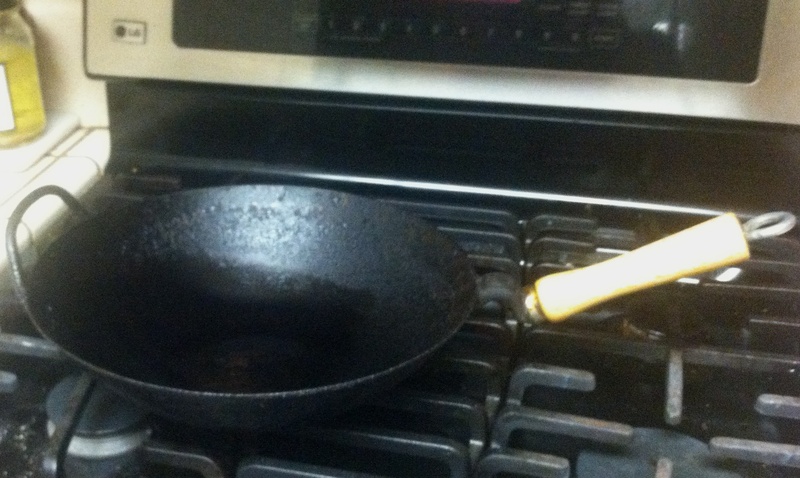 When I got divorced, the wok was the only kitchen item I kept. The wok is 12 years older than my daughter. When I die it will be the one thing that I leave her that I KNOW she will truly value. My wok cost just $25 in 1983, it is priceless today. All the other items I bought that day have been lost or have worn out and been sent to the recycler. My wok is still there. Today there is Paula Deen, Bobby Flay, Emeril, Martha and all the rest selling their stuff on QVC for hundreds of dollars. All supposed to be unique but all made in the same factory in China, they are stamped out, sprayed with non-stick chemicals and then divided into separate lines to receive the proper chefs logo and marketing materials. My wok was made by hand, in some small shop, by a person who had been making woks one at a time for years. They learned their craft from another person, who had learned from someone before them. Now I cook, teach my daughter and know that she will share the wok with her children and grandchildren. Not as glamorous as a TV chef, but real. Go out and find your own friend and start a tradition that can last another 100 years. This entry was posted in Commentary, Food and Cooking and tagged braising, Chinatown, Cooking, creativity, Food, Kitchen, salt and pepper, Thai Food, Woks. Bookmark the permalink.